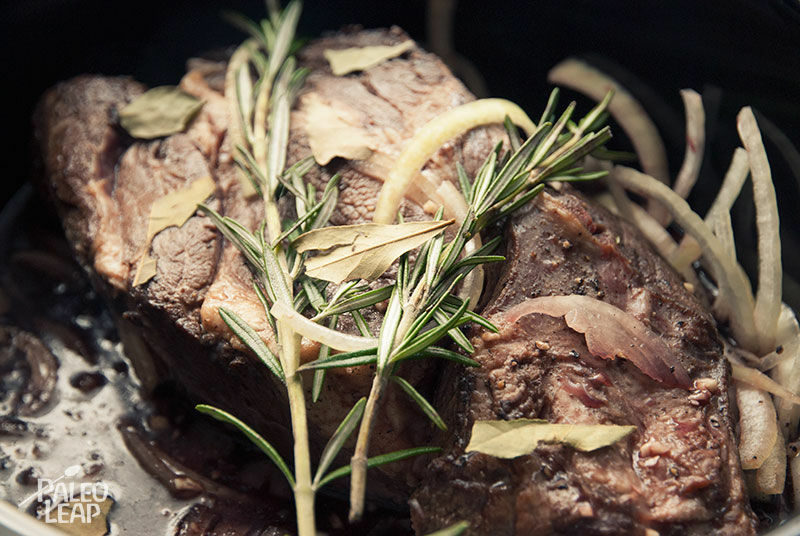 The magic of this recipe is in the liquid: a rich blend of beef stock, red wine, and balsamic vinegar gently permeates the chuck roast and flavors it all the way through. And don’t neglect the liquid itself, either! While it bubbles away in the slow cooker, it’s soaking up the flavor of the meat, vegetables, and herbs, so by the time the meal is ready, the liquid is ready to reduce into a rich, savory sauce. 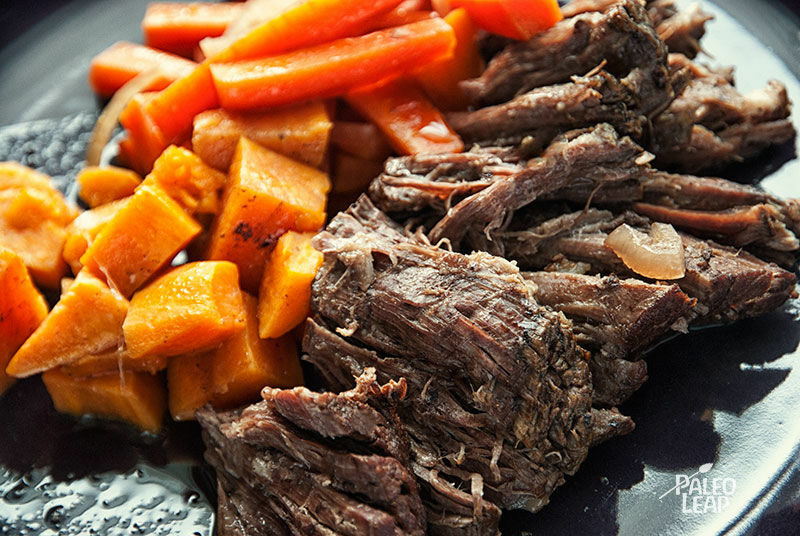 The instructions here give you a full meal, but if you have other plans for your side dishes, you can just make the chuck roast and skip the vegetables. I’d suggest adding the onion no matter what, though; it adds a lot of taste to the recipe and especially the sauce. If you don’t have a slow cooker, you can also make this one in the oven: just cook everything at 200 F until the beef is tender. It takes less total time, but it also requires a little more oversight: it’s your choice which one is more convenient. Either way, though, this isn’t a labor-intensive recipe by any means, so don’t be scared off by the long cooking time. It’s really just chopping everything up and tossing it all in the slow cooker – then the magic of food chemistry does all the hard work and you’re left with dinner at the end. SERVES: 4 PREP: 15 min. COOK: 8-10 hrs. Season the roast on all sides with sea salt and black pepper. Melt some cooking fat over a medium-high heat in a large skillet, and sear the roast for 2-3 minutes on each side. Place the meat in the slow cooker and top with the onion, minced garlic, balsamic vinegar, beef stock, bay leaves, rosemary sprigs and red wine (if using). Cover the slow cooker, turn it on low, and cook for 6 hours. Add the carrots and sweet potatoes, set the slow cooker to high, and cook for about another 3 hours, or until the vegetables are nice and soft and the meat is fork tender. Remove and discard the 2 bay leaves and rosemary sprigs. Pour the liquid from the slow cooker into a saucepan and bring to a slow boil over a medium-high heat. Keep it boiling and let it reduce until you get the desired consistency for your sauce. Pour the sauce back in the slow cooker and serve with the meat and vegetables.